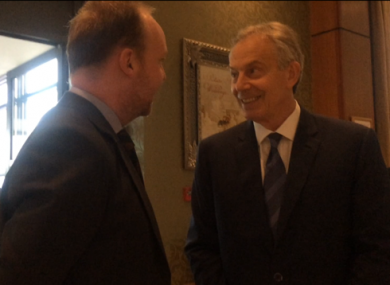 Fine Gael TD Noel Rock and former British Prime Minister Tony Blair at Druids Glen Hotel in Wicklow. “HOW LIKELY DO you think it is that Brexit will lead to a united Ireland?” the former British Prime Minister Tony Blair was asked yesterday. The former UK Labour leader was leaving the European People’s Party meeting in Druid’s Glen in Wicklow (where he had given a key-note speech) when Fine Gael’s Noel Rock grabbed him for a quick word and posed the question. However, being a calculated, smooth operative who knows how to avoid a politically difficult question, Blair side-stepped the issue. “It’s very hard actually, what do you think? What’s going to happen?” said Blair, putting the question back on Rock, with his facial expression screaming that there was no way he was going to go down that road. Rock said his mother is from Belfast, so he has a “unique perspective” on the issue. “Well you would do,” said Blair, before he was coaxed by the Irish media to answer a few questions (Michel Barnier had already avoided the media scrum by attempting to flee through the back entrance of the hotel). Blair was in much better form and eager to answer questions on a subject he is fast trying to make his “go-to” topic. After ten years away from the spotlight, the UK’s exit from the EU has allowed the controversial former prime minister resurface, with The New Yorker writing this week that he’s pushing his plan to save Britain from Brexit. While many critics state that Blair no longer has a mandate to offer his opinions on such matters, one can’t deny that there is one thing he knows a good bit about – the Good Friday Agreement. Many leading political figures such as Enda Kenny and former Taoiseach Bertie Ahern have said now is not the time for a border poll. But Sinn Féin leader Gerry Adams said this week he wants to see it become a reality in the next five years. The legal document that could bring it about is the Good Friday Agreement – however, speaking to the media yesterday, Blair said the wording of the agreement will now have to be changed in light of Brexit. When asked to clarify his comments, he said there are bits of the Good Friday Agreement that specifically assume that Britain and the Irish Republic are in the European Union. “So there is obviously changes in language, but I don’t think it should be any change in substance,” said the former British Prime Minister. But Sinn Féin are unhappy with Blair’s comments, with one source stating amending the agreement would be a breach on an international agreement. Sinn Fein has been expressing concern for some time about the potential of Brexit to undermine the Good Friday Agreement. Both governments have failed to deliver on important parts of the agreement. Sinn Féin’s focus is on defending the agreement and ensuring it continues to be the bedrock of relationships on this island and between our islands. With two British royals and one former UK Prime Minister on Irish soil this week, the changes the Good Friday Agreement have brought about are clearly visible. However, for the first time the decision on the border and our relationship with Britain is not going to be decided by Irish/UK officials and politicians closed up in a room together like it was in back in 1998 when architects of the agreement signed off on the Good Friday Agreement. Ireland now has to place its trust in Frenchman, Michel Barnier – Europe’s chief Brexit negotiator – and hope that after this week’s visit he received the message loud and clear that Ireland is in a unique position and he must fight our corner. Email “'Tony, will Brexit bring about a united Ireland? ': Blair is back and has views on Ireland”. Feedback on “'Tony, will Brexit bring about a united Ireland? ': Blair is back and has views on Ireland”.